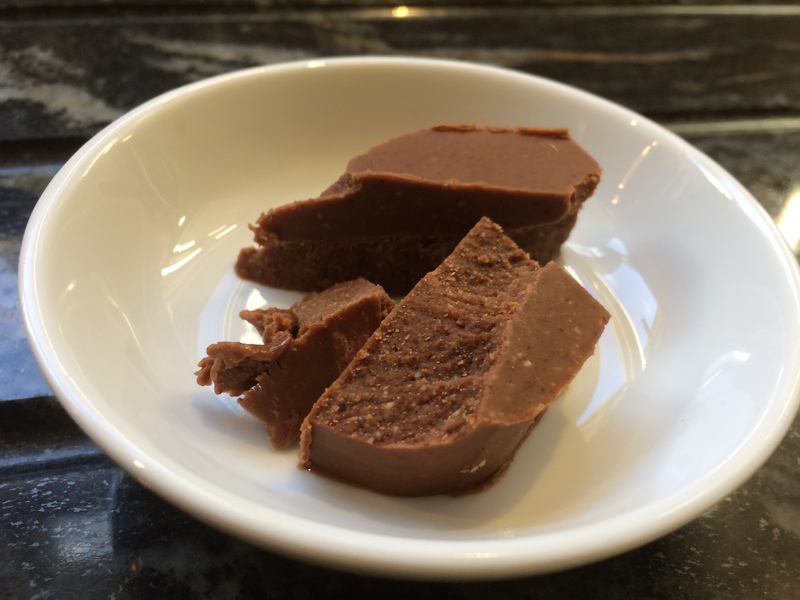 A little bit of indulgence for over Christmas – this freezer fudge is well-worth making. Chocolate and chilli always go well together and this is no exception. A mouthful of deliciously rich chocolaty fudge and then the taste of chilli a few moments later. Absolutely scrumptious. Although the recipe called for dairy-free chocolate chips, I used 100% dark chocolate chips and it worked well. I also used Kashmiri chilli powder to make sure I got the right flavour. Line a 9” x 5” loaf tin with parchment paper. Add the almond butter, coconut oil and honey to a saucepan over a low heat. Once well combined, add in the chocolate chips, cinnamon, Kashmiri chilli, nutmeg and vanilla bean. Stir until melted. Sprinkle with coarse sea salt and freeze until solid. Remove from tin and cut into pieces. Store the fudge in the freezer until ready to eat. I plan to serve mine with after-dinner coffee. Recipe adapted from My Heart Beets. This entry was posted in Miscellany, Sweets and Treats and tagged Chilli, Chocolate, Fudge. Bookmark the permalink.